Country code top level domains represent about 35% of all domain name registrations globally according to the Domain Name Stat Report published by DomainWire in May 2013. The study of data gathered over the 3-year period from 2011 to 2013 indicates that the number of European ccTLDs tends to decrease except for the ccTLDs within the 5-10% growth range. The overall renewal rate remains at approximately 79% showing a slight increase in some zones. As of April 2013, the total number of European ccTLDs has exceeded 64 million increasing within 12 months by approximately 4 million domains. That is the overall growth rate of 6,7 % from April 2012. Two out of top three ccTLDs are European domains, namely .DE (Germany) with 15.4 million domain registrations and .UK (United Kingdom) with 10,5 million domains. The world’s leading ccTLD is currently .TK (Tokelau) with 16,7 million domains possibly due to its offering mostly free domain registrations. The European ccTLD with the highest growth within a six-month period from September 2012 to April 2013 appears to be .FR (France) with growth rate of 6,4 percent. On a global scale, it is .CN domain (China) with the six-month growth rate of 82,7 %. It is to be expected, however, that the European ccTLD market is slower as it is more mature and currently facing the financial crisis. Among the European ccTLDs, the domain with the highest growth rate within the a 12-month period is .PT (Portugal – 27,4 %). Russian ccTLD .RU placed second (19,2 %) followed by .SK (Slovakia – 17,0), then .IS (Iceland – 13,3 %) and .FR (France – 12,5 %). Among the world’s top 20 ccTLDs there are nine European country code TLDs: .NL ranks number five (the Netherlands – 5,2 million), .FR is in the eleventh place (France – 2,6 million domains) followed closely by .IT (Italy – 2,5 million domains) and .PL (Poland – 2,4 million). Switzerland’s .CH (1,8 million), Spain’s .ES (1,6 million) and Belgium’s .BE (1,4 million) hold the sixteenth, eighteenth and twentieth positions respectively. 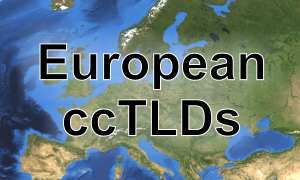 The European Union ccTLD .EU, although it does not refer to any specific European country but has an established history, ranks number 7 on the list with 3,7 million registered domains. One of the ways to present the degree of penetration of a country code TLD within a given country is by calculating the number of registrations per 100 population. The top five ccTLDs in Europe are .LI (Liechtenstein) with 188 domains per 100 population followed by .ME (Montenegro) with 105 domains and .NL (Netherlands) with 31 domain registrations. Swiss ccTLD .CH and Denmark’s .DK tied in the fourth position with 22 domain registrations. Generic top level domains such as .com, .net or .org have not been taken into consideration as they usually have a smaller market share in Europe. The popularity of using native-language characters in domain names has grown to various degrees in different European countries. Among 42 ccTLDs, 28 zones already offer IDNs (that is 67%) with the addition of .EU (TLD for the European Union) and .VA (TLD for the Vatican City). Three further zones (Belgium, Cyprus and Slovakia) are planning to implement IDNs in the near future. The top ranking IDN TLD is Russian .PФ with almost 800,000 registrations followed by Germany’s .DE with more than 600,000 IDNs. Overall, the global ccTLD market share increased by 2% within 12 months from April 2012. The most common usage of ccTLDs in Europe is for commercial purposes (61%). Germany’s .DE domain accounts for 15,5 million registrations making it the largest ccTLD zone in Europe.